Can Dogs Eat Cantaloupe, are they even healthy to dogs? Cantaloupe aka rockmelon, is a popular sweet melon that many people enjoy all year long. Watermelon and Honeydew of course are just as popular. But is cantaloupe good for your dogs? The answer is yes! Your dogs can definitely enjoy a bit of cantaloupe with you – but, there are a few things to keep in mind when it comes to offering your dog this tasty melon. Cantaloupe is so sweet and juicy, it’s tempting to eat a lot of it at once, but your dog may not tolerate the melon as easily as you do. Too much cantaloupe can upset your dog’s stomach and digestive system. 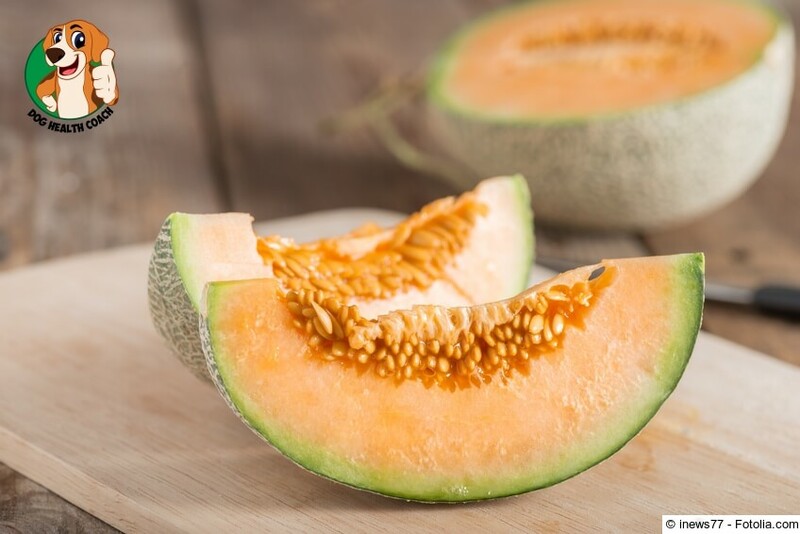 You should never feed your dog the seeds of a cantaloupe (or any melon) as they can have poisonous qualities, and cause gastrointestinal problems. The rind could also cause some digestive problems, and can be tough for your dogs to get down. But, the flesh of the melon is perfectly safe in smaller amounts. A good way to ‘test’ your dog is to offer them a very small piece of cantaloup flesh, and see if they enjoy it, and how they react to it. If they don’t seem to have any issues, you can give them a bit more, but a few small pieces here and there is always a good rule of thumb. Cantaloupe actually has incredible health properties that you’ll love for your dog, too, including lots of essential vitamins. It also works as an anti-inflammatory, which can be great for older dogs who may have aching muscles, etc. With so many sweet and delicious fruits to offer your dog, cantaloupe seems like it could be one of the best (and tastiest!) for you and your four-legged friend to enjoy. What are some of your favorite fruits to give your dog? Let us know by leaving a comment below, and if you enjoyed this post, be sure to check out our other topics on healthy, safe snacks for dogs. Did we miss anything? Please help us improve and share your thoughts in comments. Thank you for the helpful information on whether my dog can have cantaloupe. I would like to find out what other fruits I can give my dog in detail similar to how to advised about the cantaloupe. Here’s a comprehensive list on this link http://bit.ly/2nbEV9P. You simply click on the picture to learn more about each type of fruit or other types of human foods that are usually offered to dogs.